While going to sleep or waking up, your body goes numb and immobile. You’re suddenly awake and aware, but you can’t move your arms or legs… even your fingers. A terrifying ordeal! About a third of us have experienced sleep paralysis at some point in our lives, and for 5 percent of the population it happens repeatedly, often accompanied by the sense of a scary presence. 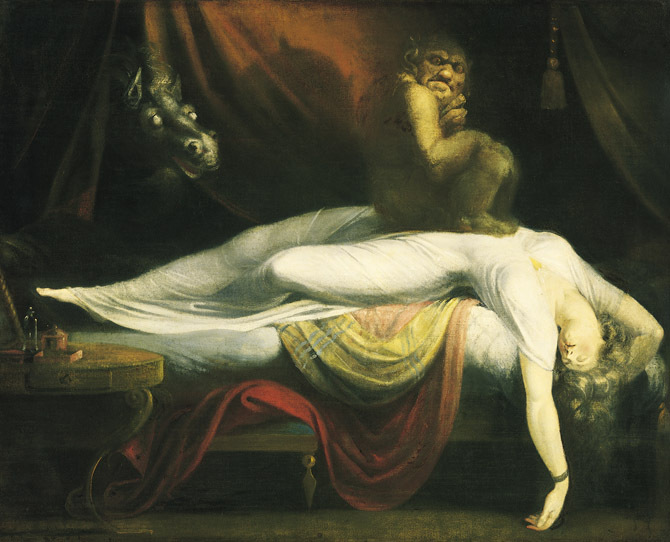 Sleep paralysis may have been the inspiration for this 1781 painting, The Nightmare, by Anglo-Swiss artist Henry Fuseli. Following are some testimonials by people who’ve experienced sleep paralysis. I’ve edited them for flow. When I have these episodes, it’s terrifying. It sometimes feels like I’m being possessed, which I know is nonsense because I’m not spiritually inclined. The first time it happened, a few years ago at age 10, I was waking up when I was pulled into the state. I felt heavy vibrations everywhere, especially my hips, and I was paralyzed… unable to move. It wasn’t particularly painful, but agonizingly uncomfortable. After the first experience, I began having them several times a week, feeling tortured by the hallucinations (moving people and figures), sounds, and vibrations. I struggled but couldn’t shake myself out of it. I thought I was dying. Eventually I would keep my eyes closed and just wait for it to stop. Sometimes I feel like I’ve awakened, but I’m dragged back into it for a few more minutes. I’ve researched astral projection and tried it, but I can’t leave my body, whether I’m in this paralyzed state or not. I’ve had many spiritual experiences through my meditations, which are usually pleasant and uplifting. I had only one paralysis incident, and it was terrifying. On that occasion I was in an alpha (dream) state while trying to have an out-of-body experience, when I suddenly found myself in a lucid dream in which I was with my class. It was a bizarre situation. A lady with a creepy voice and facial expressions was trying to explain something to me matter-of-factly, and I was narrating to the class what she was telling me. When I referred to her to the class as “this creepy lady,” I instantly woke up… but I was paralyzed. The image of the lady had me gripped in terror for reasons I can’t logically understand. I tried to rock from side to side, but I was frozen in place. I heard eerie music, sensed the presence of others in the room, and felt possessed by a demon who was now me. Then, everything disappeared and I was in a pleasing place, immersed I a deep blue. I saw my astral hand glowing in a blue light while my physical hands were under the blanket. This was more like the spiritual experiences I was accustomed to. Eventually I woke up, clear-headed, but also confused. I’ve had several episodes which are always terrifying but not really “evil” in nature. I just wake up from a night’s sleep or a daytime nap, unable to move or speak. I feel totally present in the room, but when I try to move my arms or yell, nothing happens. The most recent incident was an hour ago while I was dozing in a chair, and something new happened. When I awoke, paralyzed, I tried to shake my body violently to release myself. Nothing. But suddenly I was able to get out of the chair… sort of. I was floating in an upright position… not walking. I could see the TV still on, but I couldn’t hear the sounds. I floated toward the window and saw the neighbor’s house decked out in Christmas lights… which was weird, being summer. Then I was suddenly back in the chair. Again and again I’d float away from the chair, try to go for help, but I could only go to the same position a few feet away. I tried to scream and scream, to get people’s attention, but nothing came out except a soft moan at one point. Somehow I figured I was still dreaming, so I started shaking myself wildly, and finally felt awake. I realized I could feel, move, and speak. I’ve never felt the presence of spirits, demons or ETs as other people report, but believe me, these experiences are terrifying enough! I’ve had frequent bouts of sleep paralysis for about five years, since high school, so I’ve gotten used to them. My body’s numb, I can’t move, sometimes I can hear noises like tea kettles and guitar picking, and I can see… barely. I often see figures and shadows of people. I sometimes feel someone sitting on my chest, and it’s very hard to breathe. When I relax and think about my situation, I realize that the only way to wake up from the episode is to flinch very hard. Once I’m out of it, you’d think it’s fine, but I’m so drained that I sometimes close my eyes to rest… and then I’m stuck in the madness again. On one occasion I was paralyzed for more than an hour, and that was horrible. I don’t believe I’m being possessed by spirits or abducted by aliens, but the hallucinations feel so real. I always thought I was alone with this until my brother showed me research online, and it was overwhelming to find so many people experiencing the same kinds of things I’ve been having. I’m 14 and had my first episode three nights ago, around midnight. I was neither awake nor asleep. My instincts told me to wake up and look behind me, but I couldn’t open my eyes, even as I tried hard to move my eyelids and eyebrows. My second episode was last night, similar to the first one, but worse. I couldn’t move my arms or open my eyes, and I had chills for about 15 seconds. People say they’ve dealt with sleep paralysis for years, and I don’t think I could deal with that. I had sleep paralysis episodes over a five-month period about three years ago. It only occurred in the spring and summer, two or three times a week, and it was always scary. Usually I’d be falling asleep when I’d hear a buzzing in my ears followed by voices that were laughing and talking indecipherably. Occasionally a horrible voice would say something nasty. I was often pulled out of my body, spun around the room, and when I’d start punching and kicking, suddenly I’d be dropped back onto the bed. Occasionally I’d have episodes when I was waking up in the morning. Again, I could open my eyes and hear voices around me. A few times I felt someone climb into my bed, and, being paralyzed, that was especially frightening. After five months of the nightmares, they became milder, and I could shake myself out of it as soon as I started hearing buzzing in my ears. Eventually it just stopped. What I think is happening…. Superimposed over our physical body is our astral body, a subtle, invisible template of the physical body. Usually while we’re alive on Earth, the two bodies are mostly in sync… limb for limb… organ for organ. The two bodies can come apart, naturally, in various situations—for example while we’re asleep or meditating or having a near-death experience or in a coma or passed-out drunk… or when we die. When we die, of course, our two bodies make their final separation, and the astral template becomes our outermost body… at which point we’re no longer “of the Earth.” We get settled in an astral environment… for example in the astral Eden, which is a paradise world distinct from Earth… or in a shadowy realm that’s superimposed over the Earth. That shadow world is formed largely by the confused jumble of thoughts, intentions and misperceptions that spin off the Earth… so it’s a rather dark, unsavory place inhabited by troubled souls who haven’t yet found their way to paradise. In those non-death situations—sleeping, for example—the astral body goes off to explore, and sometimes the dormant physical body can play host to other astral beings (spirits from the shadow world), who might move in close to enjoy the experience of being in a carnal body. I suspect that most sleep paralysis experiences are caused by folks in the shadow world messing with our astral body… pulling it away from our physical body so we enter a paralyzed state… like a deep meditation or deep sleep. Only it can be terrifying, since our conscious mind is alert and aware of some sort of intrusion in our life. You already know that also pharisees, ghouls, swindlers, thieves, yes, even murderers, have their interested supporters here among the dead. And as the word “higher being”–notice that we never gave us this name ourselves–does not stand, as it is often misinterpreted by falsely religious people (to be) purified, rid of all sin, whatever the word “sin” means for them. There are also entities here interested in that situation. So, there are all sorts of people-in-spirit living in the shadow world, getting caught up in the dramas of our world. In any case, the presence of a shadow world integrated invisibly with our world is a reality… something we should not get too concerned or alarmed about. It’s been with us for eons, and it adds a little drama to our lives. Understanding the situation is a big step in overcoming the fear. Then, we can take steps to align ourselves to the light, paradise aspects of spirit. This can be done with spiritual practices such as heart meditation and prayer. As our spirit takes on a finer vibration through practiced meditation, for example, the dark dramas unfolding in the shadow world have less and less influence on our lives. Thanks once more for your insights Mark! Though I have had frequent OBEs since I can remember, the infrequent and brief sleep paralysis was only a little unsettling to me when I was very young. Never terrifying or something “bad.” It’s always a good thing to align ourselves spiritually, mentally, and physically. To understand that we are Spirit having a physical expression, rather than a body with a Spirit. However, it doesn’t matter what you “believe.” Follow Natural Law to your understanding. Being of loving service to others is the basic principle. I did some searching of my own on this subject after I saw the videoclip “Supernatural Assault” attached to the article. I found and watched a documentary that I think carries incredible and valuable relevance and ultimately it leans towards a spiritual explanation (it even makes references to the painting named “The Nightmare”, alongside of other artwork seemingly inspired by sleep paralysis). It’s called “The Entity”. It’s about 45 minutes long, and documents experiences from Texas to Africa. It lines up the experiences alongside of explanations from both modern-day academics and religious figures. I would caution that this can be intense for those who are easily startled, as it is one of the more “unhinged” documentaries I’ve seen on the subject. It’s really very enjoyable, interesting and profound. I just wanted to share this. It only further enriched my thoughts on the subject after reading your great article! Thanks for the link, Ricky. Certainly is compelling… and it does go along with the other testimonials I’ve been researching lately. Quite a strange world we live in!… or, what a strange world bristles slightly beyond our view, superimposed over our world. Surely Crop Circles are something more advanced than that Mark?! During an ITC phone call between Maggy (a researcher in Luxembourg) and her spirit friend and mentor, Swejen Salter, Maggy asked about the crop circles… and she was told that they come from a “shadow world” of the Earth. I assumed our spirit friend Swejen must have been mistaken. I believed as maybe you do(? ), that the patterns are from advanced beings far superior to us humans. Now I believe Swejen is probably right. There are many clever beings in that shadowy world, not just the meddlesome and sometimes malicious spirits who get aggressive with people as they sleep. Anyway, this is the answer that’s come to make the most sense to me about crop circles. I guess the truth will come out all in good time. Crop Circles: Crossover From Another Dimension (2006) 1hr. 15mins. Another great video! Thanks Felipe. Things move very quickly in spirit, compared to here. So, the opening comments in that film… that some of these intricate crop circles are formed in a matter of minutes… I don’t doubt that at all. Thank you for this posting. I have been in this state a number of times and was never able to make significant meaning out of my experiences. I do not recall feeling fear, but more of an annoyance that I couldn’t get anything moving. Reading other people’s experiences and your explanation is very helpful to my understanding. I look forward to the opportunity to see what I can make of my next experience. Hey John, hope you enjoy future episodes… maybe try some out-of-body adventures… in which case, drop by for a chat! I look forward to sleep paralysis. Its the only way I can exit my body. I think or read about it and it usually happens with in a few days. Getting past the fear took years but I’m happy that I persisted. That’s a new perspective on it! This entry was posted in After we die, Heaven and Earth, Inner exploration, Spiritual realms and tagged ghosts and sleep paralysis, night terrors, sleep paralysis and spirits. Bookmark the permalink.